Romantic get-away, wonderful family experience, or a time with friends. Grand View Cabin is sitting at 2,200 ft. viewing the peaks of Rich Mountain Wilderness at 4,100 ft. Similar cabins are priced 25 percent above our cabin. Our cabin offers a fully equipped kitchen, family room with a flat screen TV, two bedrooms with queen size beds and an additional bonus loft that sleeps one. Step outside onto the over sized deck with plenty of sitting area, grill a steak or relax and stargaze in the warmth of the wonderful hot tub. While you are here don't miss the incredible outdoor experiences, browsing and shopping in Blue Ridge or Ellijay just minutes away, or enjoy some of the finest dining experiences in the south. For those on a romantic get-away, after relaxing at the cabin, head into downtown Blue Ridge and enjoy the fine dining at Harvest on Main, Christy Lee's or the Black Sheep. ● Maximum of 30 pounds per dog. ● Non-refundable fee of $40 per dog per stay. ● Maximum of 2 well-behaved, house-broken dogs are allowed. for flea treatment if fleas are found after your stay. other guests, cleaning logistics, and potential damage. must be crated when you leave the cabin. ● Cats or other animals are not allowed in the cabin. step in it or see it. have been attacked by wild animals in the Blue Ridge area! or death of a dog while on the premises. GUIDELINES, YOUR REFUNDABLE DEPOSIT MAY BE FORFEITED! We are the Brinkley’s. My name is Matt and my wife is named Vickie. I am a minister and my wife is a teacher. We live in Roswell, GA and have three grown children. We are thrilled to have purchased this beautiful cabin literally on the lot next to our first two cabins. We love this cabin and are thrilled to make it available to our future guests. It is our third cabin and is adjacent to the property of our first cabin. It has two bedrooms and a bonus loft and is perfect for a couple, two couples, or a family or group of five. 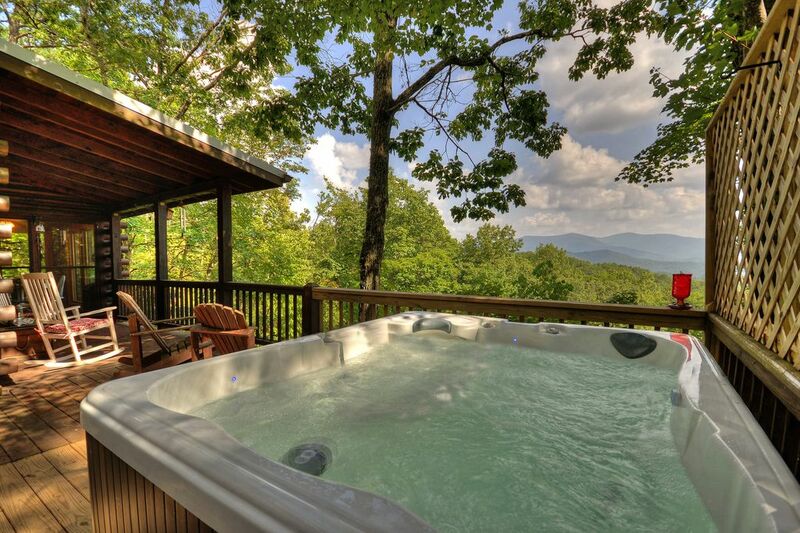 This cabin has one of the best views in North GA for a very reasonable price. It is always treated and kept up giving our guests the very best experience. The location is perfect only 15 minutes from downtown Blue Ridge. We had a great stay! The cabin was cozy with a wonderful view! As we sat on the deck in the crisp mountain morning air in the radiant sunshine, the breathtaking view and the sounds of nature were such a reminder of how amazing God’s creation is and what a blessing it was to be here. The one lane road up to the cabin can be a little challenging as you meet cars coming in the opposite direction. However, once you arrive, you are glad you made the trip. Amazing experience. Thank you for the 5 star review. Seriously, our cabin definitely has one of the best Mountain Views in Georgia. Like many of the mountain roads once you leave the main road, the short drive to the cabin can occasionally require you to pause to allow those going the other way to pass by or vice-versa. However, you are never put into any dangerous positions and the roads are easily navigable in any type of car. Beautiful cabin in the treetops!! We had a wonderful time in the perfect little cabin. Everything we needed was there and worked perfectly. We will definitely be back! This is our second time staying at Grand View. We love it! You feel like you're the only ones on the mountain. And the view is breath taking. Looking forward to next year when we return. We had a fantastic weekend getaway in the mountains. The cabin was perfect. We will definitely be coming back. Stunning mountain views! Cabin was cozy and comfortable and well equipped! We had a wonderful time! We absolutely loved everything about this property. The only thing that was a little inconvenient was driving our garbage out to either of two centers, both 6-10 miles from the cabin. We don’t mind taking our trash to a center, but it took us quite a bit off the beaten path and added to our already lengthy trip home to Florida. Shouldn’t the cleaning fee take care of trash removal? Otherwise, our girl get-away was perfect! We are thankful that the guest had a wonderful time at our cabin. We are sorry our guest experienced any inconvenience. For some reason they must have not known that one of the trash centers is less than 1/2 mile off the main road when traveling south toward Florida. Regarding the trash... if our guests desire to leave their trash when leaving the cabin they can do so and there is a nominal charge ($2 per bag). If checking out on Sunday, because none of the trash facilities are open on Sundays, guest can leave their trash at no charge. The roads in our community are navigable in any type of car. There is great hiking and fishing directly in the area. The Benton McKay trail literally runs through our community.